What’s the story behind RescueRake™? Believe me, designing, manufacturing, applying for the US patent, and marketing my own invention was the furthest thing from my mind as I came to the end of my 30 years as a technician at the phone company! I have owned Kuvasz since 1987 and right away I began doing rescue and fostering kuvasz waiting to be adopted. 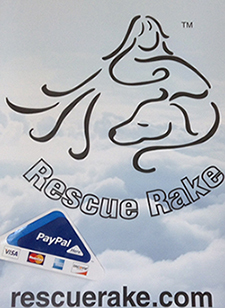 My breeder recommended that all her puppy buyers get a specific rake made by a small company. 12 years later when I began breeding kuvasz and wanted to recommend the same tool, this company was long out of business and the 1958 patent on the tool had expired. The people associated with the company were no where to be found. 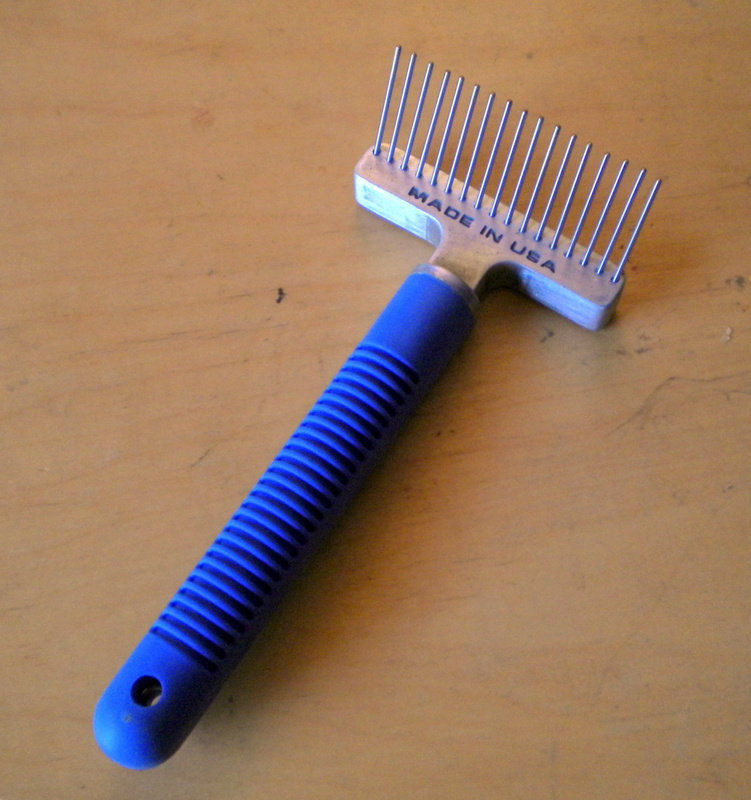 I must have tried every rake out there on my dogs to find one that was simply a wide tooth comb set at an angle across the handle… a rake! Every one I found had sharp teeth or short teeth or flexible teeth or blades or fell apart the first time you dropped it. I could find NOTHING to recommend to my puppy buyers. 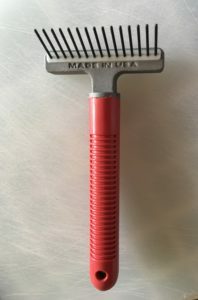 Over the years I had tried different things with the old tool I still had to make it easier to hold. The best idea I came up with was to take the grip from a pancake turner bought at a dollar store, put some padding between that and the handle, and wrap adhesive tape around the end. But since the tool no longer existed, even this solution was of no use to my puppy buyers. I started contacting and meeting with well-known American makers of pet grooming tools. 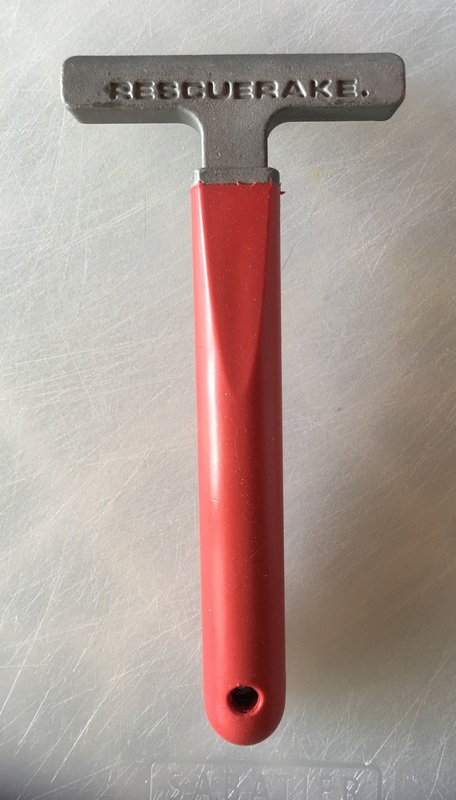 One had their designer send me photos of a few ideas, but all of them were parts of tools they already manufactured stuck together differently. 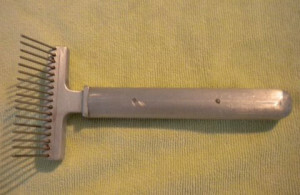 Ultimately none of the companies were interested in a new tool due to the added expense of making the angle. I was retired about a year before the US economy tanked. No one was giving business loans to a woman who had an idea and not much else. I thought about all the laid off auto workers and how many toolmakers must be playing with ideas in their garage workshops while their dogs lay at their feet. And I thought about all the people at home who would welcome even a little work at a decent wage. And of course I thought about the stray animals picked up and shaved down so that shelter workers could see what was under that matted mess. Those animals were already stressed out, why do we make it worse by shaving them down? Maybe they just need to be raked to get a good look? I thought RescueRake™ could make a positive impact on those issues and others. I couldn’t get a bank loan. I assumed I wouldn’t qualify for any grants… and didn’t want to waste time applying for them anyway. I asked dog friends if they wanted to invest in RescueRake™ and with economy as bad as it was, this certainly didn’t seem like a good idea to them. Fine, if no one wanted to be my partner, I would to do it myself. I just didn’t think it would take15 years and most of my retirement savings to get to this point! We went through several designs before the first prototype was built. I established a California corporation. 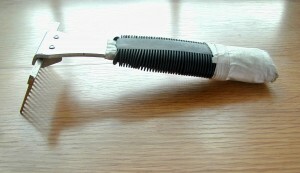 Then OK’d the prototype to manufacture 20 rakes to have field tested. 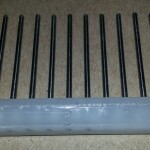 The field test showed the pins were too brittle and if they broke off, there was no way to repair the rake. Back to the drawing board! 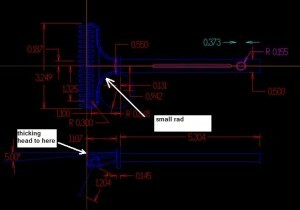 Another year of thinking and drawing and computer design… oh 3D printers at consumer prices would have saved so much time and money then! When we decided on a design we thought would solve the problem it meant building new molds for the head of the rake. 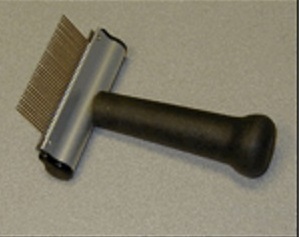 There would now be a trough where a nylon comb with pins fit in. 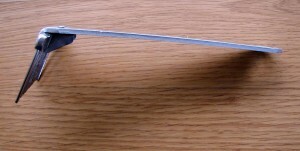 It would be held in place by set screws. 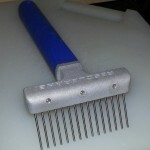 This would also permit us to offer a comb of shorter lenght pins and other attachments as well as replacement combs. 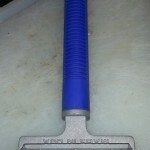 We were happy with the new version … other than the cost of having all the materials bought and manufactured in the USA. 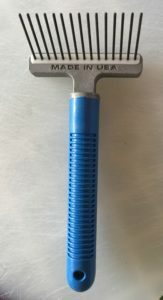 But the first thing people say when holding the RescueRake™ in their hand is how it feels substantial, like a solid tool that will last for years. Even before people put it to use they feel the quality “Made in USA” brings to a product. 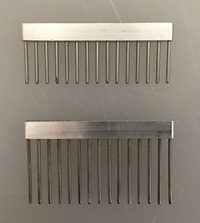 In January 2016 we changed the nylon comb rib to medical grade aluminum to work with a future “quick change connector” so both long and short length combs can use one handle. We found the quick change hardware was more expensive than buying two rakes and abandoned the “quick change” idea. The short length RescueRake™ is now available. In March, 2019 our manufacturer was no longer interested in the project and gave me one month to crate all the tooling I had paid him for and remove it from his shop! In April 2019, thanks to a buyer who had a connection within an hour of the previous manufacturer, Midwest Mold was willing to take on my project and pick up the crated tooling. 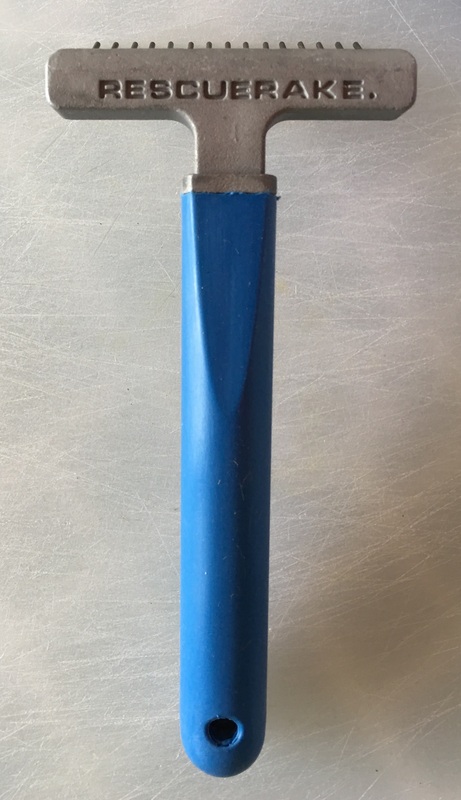 They had a few ideas to make the pins more stable, rust resistant, and most importantly with the round head pin that is the reason your dog will love RescueRake! Effective December 8, 2018, RescueRake is now manufactured by Midwest Mold in Roseville, MI. We have tweaked the design of the pins so they will remain stable through many years of use. NOTE: RescueRake is guaranteed to survive normal use for many years, if at any time you are unhappy, will we work together to make things right. NOTE: Due to changes in material and postage costs, prices may increase without notice. I will always try to keep the RescueRake affordable for the typical dog owner. The Paypal order form will always reflect the current price.